The HD Program is committed to developing techniques and technology that provide deminers with safe and effective means of mine and UXO neutralization. The Mini MineWolf (MMW) is an armored, remote controlled mine clearing system using tiller and flail attachments. The tiller`s teeth engage the ground to a depth of 25 centimeters, physically destroying anti-personnel (AP) and anti-tank (AT) landmines, and mulching vegetation up to 15 centimeters in diameter. With either attachment, the MMW can survive both AT and AP mine blasts. Clearance rates of 5,000 - 12,000 square meters per day can be expected depending on soil and vegetation type. Operation is by remote control with video monitoring. Distribution Statement A: Approved for public release. 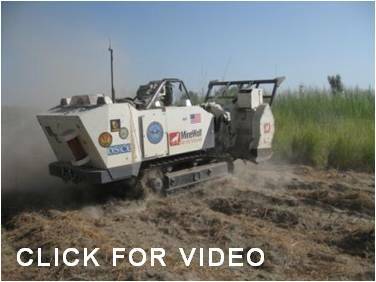 The Medium MineWolf is a powerful remote control or manually operated mine clearing system that uses large earth tilling and flail attachments to neutralize landmines. The tiller’s teeth engage the ground to a depth of 25 centimeters, physically destroying anti-personnel (AP) and anti-tank (AT) landmines, and mulching vegetation up to 15 centimeters in diameter. The Medium MineWolf can survive both AP & AT mine blasts. Distribution Statement A: Approved for public release. The Rebel Crusher is a commercial mobile soil sifter and rock crushing plant modified for demining operations. It is designed to operate in areas where a significant fraction of the soil is composed of mine-sized objects (rocks) which make sifting difficult, or where dense metallic clutter makes mines undetectable. Modifications to the system include hardening the crushing chamber to withstand anti-personnel mine blasts, and increasing the capacity of the sifting mechanism. The Rebel Crusher is capable of processing 75-125 tons of soil per hour. Distribution Statement A: Approved for public release.